The Umpire Ejection Fantasy League announces UEFL University, a new instructional initiative for 2016 that presents and illustrates the playing rules of baseball. Though all of our educational material will now fall under the umbrella of the freely-available UEFL University, the initiative's flagship production is the all new UEFL Video Rulebook, conceptually illustrated below. 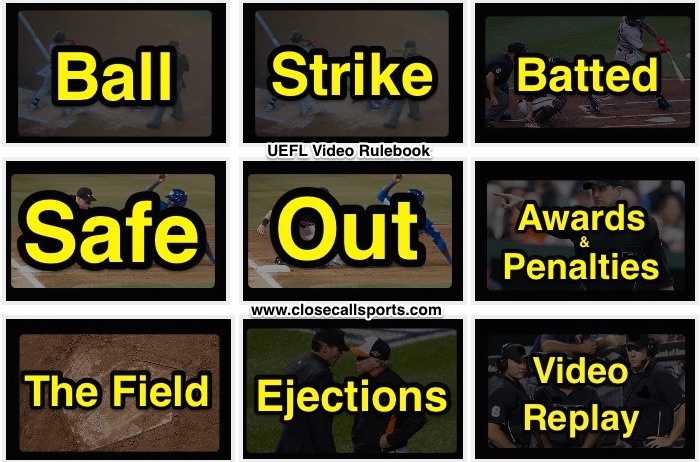 The UEFL Video Rulebook home page will feature a table with nine images, pictured below, that players, coaches, umpires and fans alike may click through to access video illustrations of each principle. Every image that you see within the nine areas of the UEFL Video Rulebook will be linked to a video illustrating the concept at hand. Over the remainder of Spring Training, each of the nine areas will be introduced: the final product—the homepage linking to each area—will be live by Opening Day 2016. Top Row: Pitched Ball. A pitched ball generally will result in a Ball, Strike, or Batted Ball. Middle Row: In the Field. A ball put into play will often yield a Safe, Out or an Award/Penalty. Bottom Row: Extracurriculars. Describes the Playing Field, Ejections, and Instant Replay Review.